I was once a minimalist. Faced with the need to sell our house quickly, my husband and I (with the help of my mother-in-law) packed every belonging not strictly necessary for sustaining life and carted it off to a local storage unit. Our out-of-season clothes, extra chairs, and bulky file boxes disappeared in a single afternoon. Gone were the tangled cords of phone chargers and the riotous color of children’s art projects. No longer did our refrigerator door bristle with missionary prayer cards, or our bookshelves sag under the weight of Bible commentary sets. In their absence, our home became a minimalist temple—an open-concept sanctuary with gleaming surfaces and unadorned white walls. We sold the house less than 24 hours later. Our minimalist period lasted a few days longer, while we signed papers and continued to show the house just in case. But even before the first weekend had arrived, we realized we actually needed those extra chairs to host Sunday lunch. And our kids started missing the bins of toys we’d carted off. And we did, after all, have to charge our phones somehow. Item by item, our house returned to its natural state: not exactly cluttered, but no longer ready for a profile in Architectural Digest. I was a minimalist for less than a week. But I loved every clean, simple, sleek minute of it. With interest, then, I watched Netflix’s documentary Minimalism, which explores the intentionally pared-down life. The film’s 78 minutes follow Minimalism: Live a Meaningful Life co-authors Ryan Nicodemus and Joshua Fields Millburn on their 10-month book tour as they proclaim the message of minimalism across the country, carrying with them only a single change of clothing and an assortment of Apple devices. Their thesis is that “everyone is looking for more meaning in their lives” and that people will find true happiness when they live “deliberately with less.” This is Nicodemus and Millburn’s personal testimony, and it’s supplemented throughout the documentary by vignettes of other Americans who’ve eagerly adopted minimalist lifestyles. For evangelical viewers, Minimalism’s narrative will have a familiar ring. A person finds himself with “an underlying discontent” he attempts to fill with temporal acquisitions and accomplishments (“[I was focused on] getting a better promotion, getting a better house, getting a better car, getting a bigger paycheck, being able to buy more expensive bar tabs”). Eventually, worldly stuff and success prove unsatisfactory (“I was commuting for about two hours a day and then sitting in a cubicle for 10 to 12 hours a day. I had gained weight. I was unhappy. And I was kind of like, What’s wrong with me?”). He then decides to pursue a new way of life. The testimony inevitably ends with a joyful description of waking up each day without extra belongings, utility bills, or regular paychecks. In contrast to the restless misery of the person’s former stuff-filled existence, he now describes himself as “freer and happier and lighter.” He who once was lost—aimlessly wandering IKEA showrooms—has been found by minimalism, and his life is forever changed. The conversion story of Minimalism parallels the one described in Marie Kondo’s 2014 bestseller, The Life-Changing Magic of Tidying Up. While Minimalism feels masculine—disproportionately featuring young males in Spartan homes designed for a single occupant—Tidying Up has a more feminine appeal. (Kondo winsomely discusses navigating relationships and cultivating beauty and how best to store your collection of handbags.) But the essential narrative of finding peace and purpose through getting rid of possessions is the same. Tidying—which Kondo defines as “taking each item in your hand, asking yourself whether it sparks joy, and deciding on this basis whether or not to keep it” (178)—becomes “the magic that creates a vibrant and happy life” (127). Ten Speed Press (2014). 224 pp. $16.99. Kondo writes, “The lives of those who tidy thoroughly and completely, in a single shot, are without exception dramatically altered” (178). Citing testimonies from former tidying clients who subsequently lost weight, launched businesses, jettisoned unlovable spouses, and found happiness, Kondo claims that discarding unnecessary items will be “life transforming” (3). Tidying up is the death that brings new life. Both Minimalism and Tidying Up have undeniable appeal. Most of us easily envision ourselves as more carefree if our lives could contain more of the things we really love and less of the things—like health insurance statements and smelly soccer cleats—we don’t. Both narratives also contain elements of truth. First-world citizens often do accumulate possessions to excess. We idolize our belongings and base our sense of self-worth on the newly acquired contents of our Macy’s shopping bag. We compare our stuff with others’ stuff in an endless cycle of covetousness. We’re also heedless of the consequences of our consumerism. In our pursuit of stuff, we become thoughtless stewards of creation and poor neighbors to those who produce goods in unsafe conditions for unfair wages. But minimalism is not the gospel. Christian finds freedom not in lifestyle changes or donations at the local charity shop but in Christ. He finds relief not in what he has done but in the One who has done everything for him; not in needing less but in acknowledging his complete dependence on his Savior; not in the arrival of the recycling truck but in the beauty of the cross. Like Christian’s, our greatest burden is the sin that drags us ever closer to an eternal grave. And only in looking to Jesus can we ever be truly free. This morning, I went down into my basement and realized it could use a minimalist cleanse. Items I carefully packed from our last house are still sitting, unopened, in their orange-and-brown moving boxes. Yes, tidying up would probably be a good idea. But it wouldn’t free my soul. Marie Kondo. 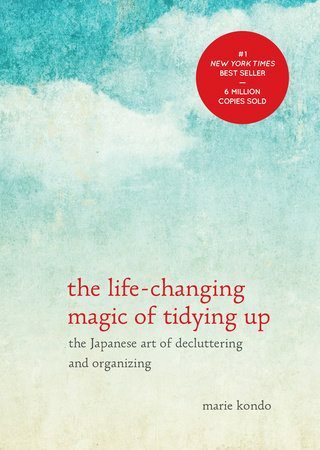 The Life-Changing Magic of Tidying Up: The Japanese Art of Decluttering and Organizing. Ten Speed Press, 2014. 224 pp. $16.99.